La Plata is the capital of Buenos Aires province. It is commonly referred to as the “ciudad de los tilos” (linden city) because its streets and squares are lined with linden trees. Its most common nickname however, is “ciudad de las diagonales” (city of diagonals), because urban planner Pedro Benoit, designed its unique city grid full of diagonal streets with small parks or squares every six blocks. It also has rich architecture including a Le Corbusier building, the Catedral de La Plata, which is the largest church in Argentina, and La Plata University, which includes an observatory and a natural history museum, amongst others. Museo de Ciencias Naturales de La Plata: This famous natural sciences museum has a permanent exhibit that traces the history of life from the inorganic to the organic and concluding with mankind and culture. It showcases over 2,500,000 objects including dinosaur fossils. Open Tue-Sun from 10am-6pm. Tickets 6pesos. Paseo del Bosque S/Nº. La Plata. (54-221) 425-7744 / 9161 / 9638. museo@museo.fcnym.unlp.edu.ar. 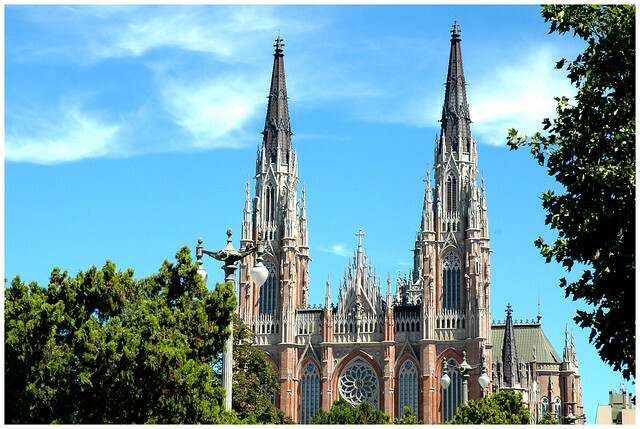 Catedral Metropolitana de La Plata: This stunning New Gothic style church is the largest in Argentina, and has 37 French and German vitraux, impressive carvings and religious icons and an ecclesiastic museum. Open Mon-Sat 9am-7pm and Sundays from 9am-8pm. calle 14 between 51 and 53. La Plata. museocatedral@speedy.com.ar. Casa Curutchet: Swiss architect Le Corbusier built this house for Dr. Curutchet between 1949 and 1953. Now a day it is leased to the Colegio de Arquitectos and can be visited from Tuesday- Friday between 10am-2pm. Entry fee: 40 pesos. 53 Street # 320. La Plata. – Buenos Aires – Argentina. casacurutchet@capba.org.ar. Parque Provincial Pereyra Iraola: This natural reserve on the outskirts of La Plata city once belonged to the aristocratic Pereyra Iraola family. The premises, which spread over 10,000 hectares, have over 100 tree species, and are commonly visited for bird-watching and horseback riding. It is also an architectural landmark as it has a pampa-style estancia from the 1800’s, where the family lived. República de Los Niños: This Disney-style children’s theme park on the outskirts of La Plata was built in the early fifties for civic learning. The team of architects based the design on stories by Hans Christian Andersen, the Grimm brothers and legends by Tennyson and Mallory. The park also includes a doll museum with dolls from all over the world. The theme park can be visited every day from 10am-6pm and costs 10pesos to get in. Camino General Belgrano and 501, M. B. Gonnet, La Plata. 0221-484-1409. The best option is to take a long distance bus from Retiro, which takes approximately an hour to an hour and a half, depending on traffic and on the bus. Buses leave every twenty minutes from the Retiro bus terminal, and tickets cost 20 pesos for the fast bus and 10 pesos for the slower bus that also stops at Constitucion. The bus service is Terminal Costera linea 195 and the timetable is available here. Another option, which takes longer, is to take the train from the Constitución Train Station. See timetable here. There is also an English Tour of La Plata with hotel pick-up and drop-off. More information here. This entry was posted in Architecture, Argentine Culture, Museums, Off the Beaten Path and tagged buenos aires,, casa curutchet, cathedral, ciudad de los niños, La Plata, le corbusier, Natural sciences museum, Off the beaten path, park, theme parks by Fierro Hotel Staff. Bookmark the permalink.